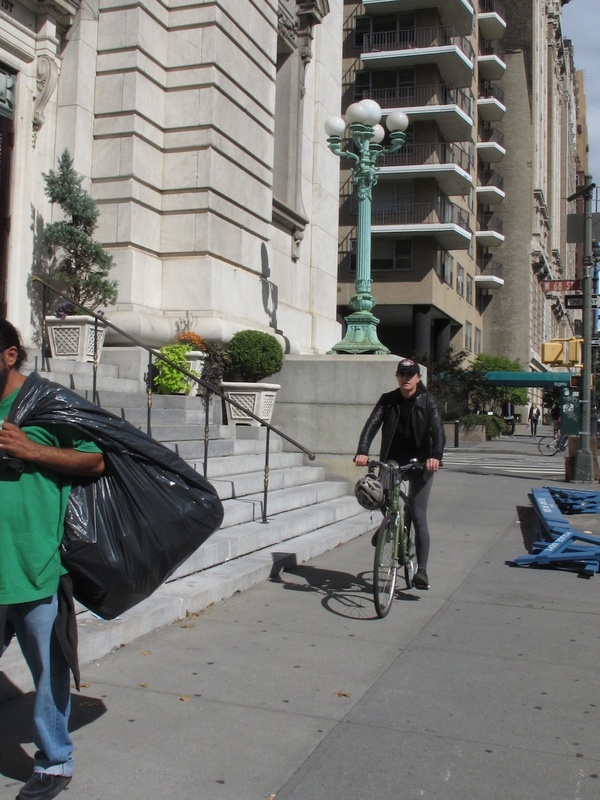 Are NYC Pedestrians Less Important Than Carriage Horses? 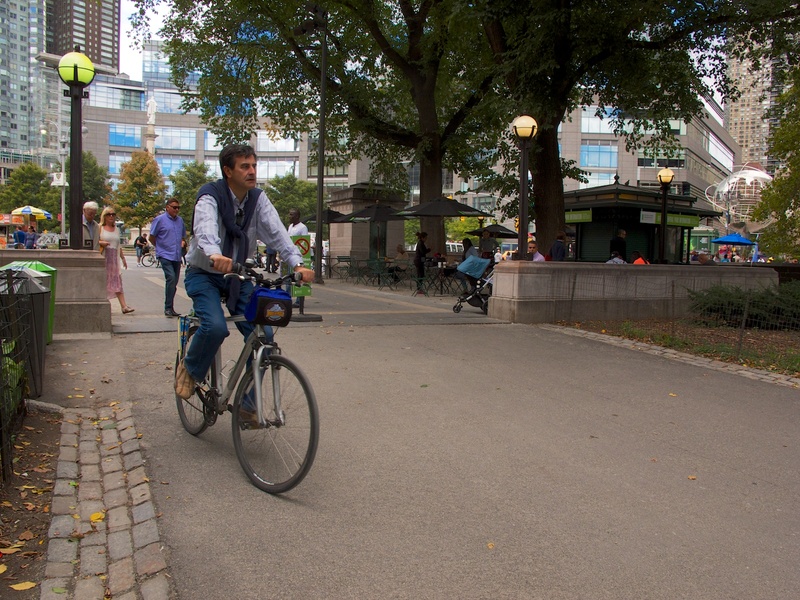 In New York City, biking safety is measured by pedestrian body count. Not too many individuals are killed by lawless bike-riders, therefore biking is safe. Nonetheless, most people I know, even cyclists, report that they are terrorized by bike-riders on sidewalks and in crosswalks on a daily basis. It is poor sportsmanship to say that cyclists should obey traffic laws or that they are anything less than a public good. When I was hit by a delivery biker while I stood behind the pedestrian barricade at the Second Avenue subway construction site this summer, the useless safety guard was amazed that I could expect any assistance. That wasn’t her job description, apparently. She thought it was an explanation when she snapped, “I am here to help people.” Not to worry, I stopped limping the next day. Well today Jill Tarlov, 58, was stopped completely. The Connecticut wife and mother of two died this morning after several days of brain death caused by cyclist Jason Marshall, 31, who struck her down near West 62nd Street in Central Park on Thursday. The N.Y. Times reported the incident as well as the passion of New Yorkers whose concern about lawless cyclists is habitually ignored. As of this posting, he has yet to be charged with a crime. The N.Y. Post reported that Marshall has boasted of speeding on this $4,000 bike on the website http://www.strava.com. As of this posting, he has not been charged with a crime. Hopefully, since one specific horror can illuminate festering wrongs, Tarlov’s death will be as transformative as the knock-out punch thrown by former Baltimore Ravens running back Ray Rice against his then-fiancee. Revealed on a security video tape, it brought into focus the chronic violence against women that the National Football League and our Super Bowl-loving nation has long ignored. Now even the football commissioner has been shamed into paying attention. Clearly, the city’s two-week police crackdown last month on cyclist law-breakers did not work. We need serious law enforcement every day, including the law that forbids anyone over the age of 14 from riding on the sidewalks. In addition, we need statues that require all cyclists to be licensed or registered and to wear large, visible registration numbers on their backs. Above all, cyclists must affix working headlights to their bikes and turn them on, as cars must, when twilight begins. Cyclists wearing black clothes in the black of even early black night are invisible to hapless pedestrians who dare to leave their homes after sundown. The green light at left means that this biker had a red and should not be in crosswalk. Police presence did not faze him. This man rode away when volunteer told him to dismount when on a pedestrian pathway. In this photo he returns to ignore park rules and rejoin a female companion who dismounted and waited for him. Outside the park, this well-heeled cyclist grimaced and dismounted after I took her photo. She knew she was doing the wrong thing. If I did this while waiting for a bus, what could police accomplish? It’s time to get serious. Mayor deBlasio believes he had to take a principled stand again carriage horses. Let him take a stand against cycling scofflaws who ruin the quality of life of people who are trying to walk down a sidewalk or cross a street. CBS News, which employs Jill Tarlow’s widower, has promised to report on the issue. For most of New York’s media, that would make a real change. Here is the statement from Anton Guitano, Chief Operating Officer, CBS Local Media, and Peter Dunn, President, CBS Television Stations: “We are heartsick over the passing of our dear friend and former 1010 WINS Radio colleague Jill Tarlov. As we mourn the loss of our friend and console Mike and his family, we are committed to doing what we can to bring greater public awareness of the perils of unsafe and distracted driving by motorists and cyclists that endangers pedestrians. Far too many people have been killed or seriously injured on our streets.” To this I would add: Terrorized too. Funny the rider in the photo lower left doesn’t look under age 14 to me. Please comment and click on “Leave a reply” below. 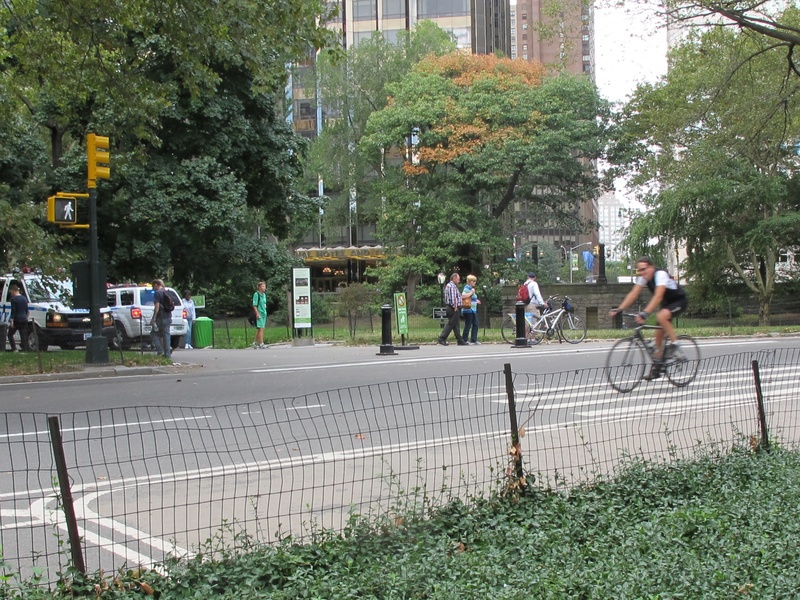 Cyclists in Manhattan are taking better care of themselves and possibly of pedestrians too, according to a recent study from Hunter College. More bike riders are stopping at red lights. Fewer are riding against traffic. Citing articles saying that there have been only two dozen minor injuries involving Citi Bike riders and no fatalities, the report suggests that this is because Citi Bike share riders are more cautious and rule-compliant than other cyclists. • The number of female cyclists has increased by 9 percent in the last four and one-half years, possibly because of the bike-share program that began last May. • Almost three-fourths of commercial cyclists now wear helmets, three times as many as in 2010. Nearly half of male “general” cyclists now wear helmets, up from 32.2 percent in 2009. • Nearly sixty percent of commercial cyclists wear “upper body apparel” identifying the name of their business, as required by law, twice as many as in 2011. 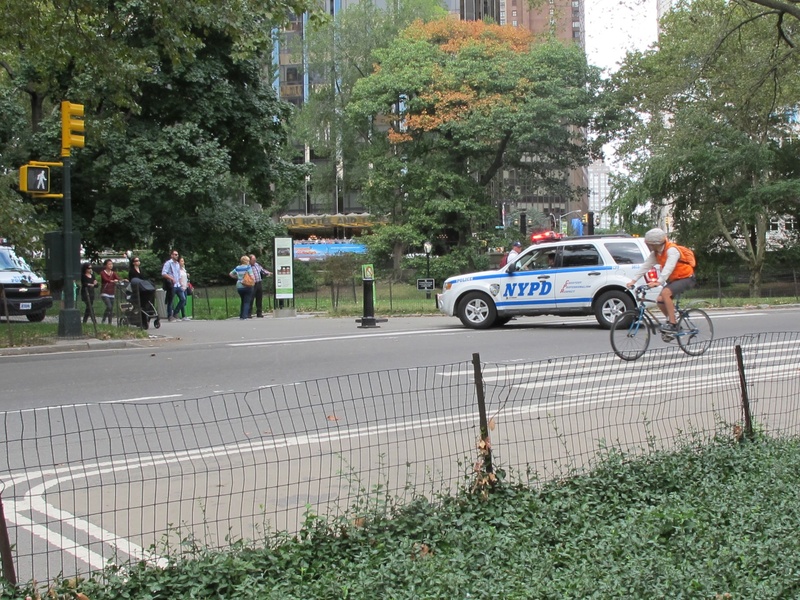 Graduate and undergraduate students of professors Peter Tuckel and William Milczarski observed 4,316 bicyclists at 98 different locations in central and lower Manhattan. Comparison was made against a study the professors published in 2011. Kudos to them and to Hunter College for developing data on something all New Yorkers have opinions about. The report Bike Lane + Bike Share Program = Bike Safety predicts that safe cycling in New York City is likely to increase. It is true that the delivery guy who nearly cycled into me while I was walking down the sidewalk was wearing a helmet, so I am prepared to hope, if not yet to be convinced.